The huge demonstration in Cairo's Tahrir Square on Tuesday is the sharpest reminder yet for President Hosni Mubarak's regime that the protest movement is not being worn down. The sheer numbers involved increase the pressure on the president to go. Just outside the square I met Zyad Elelaiwy. Less than a month ago, he was one of a group of like-minded Egyptians who were fed up with their country's corruption, stagnation and brutality. So they decided to organise a demonstration on 25 January. They had seen how street protests had overthrown an authoritarian president in Tunisia the previous week, and they wondered if they could do the same for Mr Mubarak. "To be honest, we thought we'd last about five minutes," Mr Elelaiwy told me, next to long lines of men queuing up on a bridge over the Nile to enter Tahrir Square (women don't have to queue up). "We thought we'd get arrested straight away." But the demonstration was much bigger than they ever expected, and the regime started to crack. Egypt is now a different country to the one it was on 1 January, when President Mubarak seemed as well established in power as ever. The ruling party, the NDP, had just rigged an election in a way that was breathtakingly cynical even by its own standards. The president, despite grooming his son Gamal as his most likely successor, was pointedly not ruling out standing for another term. But after two weeks of street protests, Mr Mubarak has said that he will not stand again. His son is ruled out as his successor. The regime has begun, slowly and grudgingly, to talk about reform. And thousands of protesters are still camping out in the centre of Cairo. The banned Muslim Brotherhood has been in official talks with the government. Many Egyptians have conquered their fear of the police state. Comments by foreigners about Cairo returning to normal because some shops have opened and some streets are once again choked with traffic are a touch condescending. Londoners would not think their city was anything other than wildly abnormal if tanks were on the streets and demonstrators had taken over Parliament Square and much of Whitehall. The fact is that the demonstrations against President Mubarak, inside a fortnight, have changed Egypt in ways that his opponents barely dared to dream about at the start of the year, and more change will come. But the regime is well entrenched in power and is pushing back. It is a contest of will, and stamina, and it is going to get tough for the protesters. It is clear that President Mubarak and his new Vice-President Omar Suleiman are trying to preserve as much of the old system as they can. They have notched up one major achievement. In unscientific conversations in Cairo, I have had the strong impression that many Egyptians have bought the president's argument that if he goes immediately, as the Tahrir Square protesters are demanding, then the country will slip into "chaos". I have heard that from people who are glad to see the president go in September. That thought, I suspect, is easier to have for Egyptians who have not had personal experience of the president's security agencies. Silencing the regime's critics in the name of stability has been a Mubarak priority since the beginning. His opponents are infuriated by what seems to be the successful retread of an old refrain. They say that the regime, not the protesters, creates chaos. And they point out that they have no reason to trust anything the president and his close associates say, including his decision to step down in September. Western diplomats are expressing their frustration about the slow pace of change at the top. One was incredulous when asked about the president's argument that his presence at the top stabilises the country. "Are you kidding? Cairo's in chaos already. The economy's collapsing, they're jeopardising all the economic progress they've made over 20 years," the diplomat said. As for the attitude of Mr Suleiman to reform, another diplomat said: "Omar gets it, but his heart isn't in it." The vice-president is said to have won Mr Mubarak's confidence by saving him from an assassination attempt. It is hard to imagine him pushing his old boss out, even if he could, before September. Even so, the Americans and their Western allies are abstaining from too much public pressure. President Barack Obama declared himself pleased with Mr Suleiman's discussions with some opposition figures over the weekend, even though the vice-president's interlocutors were not. The Obama administration's calls for a transition of power have lost the urgency they had when demonstrators were being killed in the streets. A key reason for that, and perhaps a vital moment in the crisis, was the army's decision to deploy properly in the square last Friday. They created a perimeter around Tahrir and sent in enough men and armour to enforce it. That had two crucial consequences. They were providing the anti-Mubarak demonstrators real protection for the first time. Most of the clashes stopped, because the two sides were separated. But it also meant that the army established some control. The barbed wire made it very hard for the demonstrators to cause trouble elsewhere for the regime. And it made it easier for the army to filter who went in and out of Tahrir Square. As I write this, for example, I am not in the square because foreign journalists without Egyptian press cards are not being allowed in. The BBC has, of course, applied for press cards for its visiting news teams - but the applications have been parked somewhere inside the Egyptian bureaucracy. This is an unfinished revolution. When historians look back at it, the precise timing of President Mubarak's departure is not going to be their main preoccupation. Assuming he goes, what will be important will be the fact that an authoritarian who looked untouchable was forced out by the will of the people. 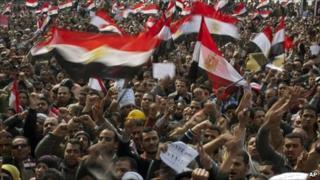 The real test of the revolution's success or failure is whether it changes Egypt permanently. That does not mean changing the face at the top to preserve the system. It means democracy, and the elections in September will be a very big test.